You can make loaf bread at home with this Pullman pan. This Loaf Pan with Cover is perfect for making 1lb Loaf Bread ,slices of the sandwich bread. The lid of loaf pan is for making the bread with good shape. And you can also use the pan without lid to make traditional raised bread. The hole in the bottom is for air circulation when baking. Washing Note: Don't use the abrasive Brush to clean the pan. Remarks: The color will be a little different because of photograph and monitor. 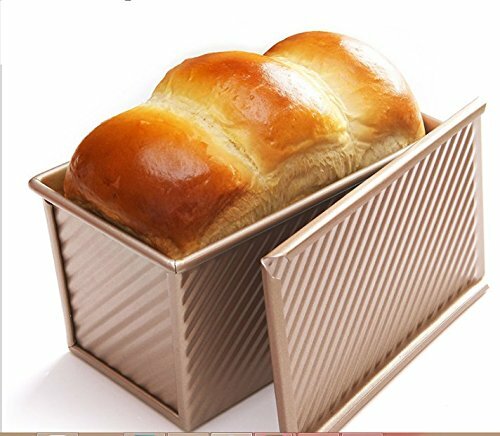 Pullman Loaf Pan with a Lid can make beautiful Loaf Bread and slices of sandwich bread at home. Loaf Pan is Made of Heavy Aluminized Steel and Food Safe Non-Stick Coating. You can make Loaf Toast Bread at home and it is perfect gift for bread lover.